Last spring, retired History professor Dr. Joe Cafaro led a group of travelers to sites in England and France on the inaugural Panther Treks trip. It was such a success that another adventure is planned March 23-31 to Rome, Florence and Venice, Italy. Coordinated through the Office of Alumni and Community Relations, Panther Treks are designed for people who are still working and only get a week off for vacation, said Martha Pirkle, Director. Although the primary audience is alumni, trips are not exclusive to LC alumni, she said. During the nine days in Italy, participants will learn about three great Italian cities as they visit Rome’s preserved ruins, explore Renaissance architecture in Florence and discover renowned cathedrals and cuisine of Venice. Enjoy free time each evening as well as free afternoons in each city. Cathy Hunt ’81 went with her husband, Ron M’08, Ed.S.’11, and said it was an unforgettable experience. She said she and her husband have already signed up for the 2019 adventure. Dr. Cafaro said a lot of planning goes into each trip. He said he also tries to balance structure and flexibility in the scheduling. The trip’s cost includes round-trip air transportation to and from Atlanta (including departure fees); a full-time tour director; seven night’s accommodations in rooms with private bathrooms; seven breakfasts and dinners; 24-hour emergency service; all tips; guided visits to the Vatican and Colosseum in Rome, and sites in Florence and Venice, as well as entrances to the Colosseum, Forum and Duomo. Not included is passport and visa fees, beverages with meals, trip insurance and checked baggage (depending on the airline). For more information, contact alumni@lagrange.edu. The Panthers (4-9-2, 1-6-1 USA South) ended their season with a scoreless tie against visiting Agnes Scott in a USA South game Monday. Goalkeeper Emma Smith had eight saves in the game for LC. The Panthers (10-7, 5-6 USA South) beat Averett 2-1 and lost 4-0 to East Division-leading Greensboro last weekend. The win over Averett guaranteed the team its first winning season since 1993. LC closes out the regular season today (Friday) at Brevard in a USA South game. The Panthers have clinched a berth in the upcoming USA South Tournament next week. LaGrange (8-11, 6-6 USA South) lost 3-0 at West Division-leading Huntingdon on Wednesday in a USA South match. Jazzlyn Kenner tied for match high with 11 kills for the Panthers. LC closes out the regular season Saturday against Agnes Scott and Berea in a USA South tri-match in Berea, Ky. The Panthers have clinched a berth in the upcoming USA South Tournament next week. The 14th-ranked LaGrange golf team concluded its fall schedule by tying for fourth at the Chick-fil-A Invitational in Rome, Georgia. Sophomore Ben Womack tied for 11th and freshman Mathias Andersen tied for 13th in the individual standings. The LaGrange cross country teams will compete in the USA South Championships today (Friday) at Maryville College in Maryville, Tennessee. The LaGrange swim teams compete at the Sewanee Invitational today (Friday) and Saturday. 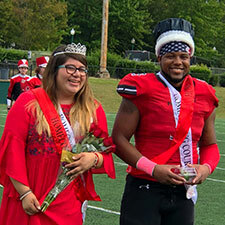 Bianey Diaz and Shamar Slappy were crowned Homecoming Queen and King during halftime ceremonies at Saturday’s football game. The event capped off a busy week of student activities including a comedy show, mini-games, lip-sync battle, canned food sculpture contest and dress-up days. Winners were Alpha Delta Gamma, medallion hunt; Delta Tau Delta, banner contest; the Black Student Union, SGA Mini Games and Can-Struction; and Phi Mu, best float. The overall winner for the week was the Black Student Union. “Crazy for You” continues its run through Sunday in Price Theater. Show times are 7 p.m. today (Friday) and Saturday, and 2:30 p.m. Sunday. Tickets are $15 for adults, $10 for senior citizens (55 and older) and non-LC students and free for LC students faculty and staff. The box office is open weekdays from noon until 4 p.m. Email the box office to make reservations at priceboxoffice@lagrange.edu, or call 706-880-8080. If emailing or calling, please leave name, the performance date/time and number of tickets desired, type of tickets and a call-back number and email address for confirmation. The annual Fall Festival will be held from 5:30 until 7 p.m. Monday on the patio beside Smith Hall. The event is for children ages 3 to 10 and will feature face painting, carnival games, a haunted house and supervised trick-or-treating in Hawkes Hall. Parking is located in the visitor’s lot across the pedestrian bridge. Brian Carlisle, Vice President and Dean of Students, and Caitlyn Deal, SGA president, will host a porch chat on the front porch of Smith Hall at 10 a.m. Nov. 2 and 1 p.m. Nov. 9. Students are invited to grab a coffee, pull up a rocking chair and get to know campus leaders. This Saturday’s Fall Service Saturday on West Point Lake has been canceled. For more information about Chattahoochee Riverkeeper and to learn about other volunteer opportunities, please visit https://chattahoochee.org/. The Center for Leadership and Career Development will host the fourth annual Halloween Open House from 10 a.m. until 2 p.m. Wednesday in the Career Center, Smith 104. Students are invited to drop by for fun, food, prizes and tips on how to navigate a successful job search.